The word is out: Blizzard's Bonafide is one of the best skis on the mountain today, a versatile All Mountain masterpiece that consistently surpasses expectations. With the Bonafide, Blizzard gives us perhaps the very best realization to date of the one-ski-quiver concept. On-trail, the Bonafide is a confident carver, with an smooth, easy ride that never feels sluggish or sleepy. Like Blizzard's Cochise, the flip-core Bonafide blends the performance and feel of a traditionally-cambered GS racing ski with modern rockered geometry, to brilliant effect. Compared to the Cochise, the 98-millimeter Bonafide offers better edge-to-edge quickness and turn shape versatility. While the Bonafide can't match the Cochise's flotation, in soft and even deep snow the Bonafide is otherwise every bit as sweet and smooth—and more active. The Bonafide shines all across the hill, in all conditions. It loves tight, steep spaces, and it loves to go fast. It is quick enough for trees and bumps, and perfectly capable on hard snow. By nature it is a generalist, but this is not a ski you reach for as a compromise—indeed, you may well find yourself preferring the Bonafide even over targeted specialists. That is certainly true of fatter All Mountain planks, but, shockingly, it is also often true even regarding dedicated hard snow carvers. It's not so much that the Bonafide outperforms these specialists in any single metric. Rather, it is that, on any given day, in any given conditions, the Bonafide is likely to simply, wonderfully, almost magically deliver more fun. The Bonafide has profoundly changed my own thinking on just how good an All Mountain ski can be. Getting to know its sister model, the Kabookie (essentially, a touring-oriented Bonafide), I found myself actually wanting to ride the Kabookie more than any other ski I owned. And that was true almost regardless of conditions. Yes, the specialists still have their place. 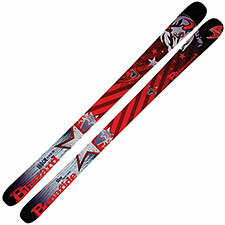 But the Bonafide proves we no longer have to think of generalists as watered-down versions of better skis. In that sense, the Bonafide truly does stand alone. If you are remotely interested in the All Mountain category, this is a ski you have to try—and will very likely want to own. Highly recommended.